to authoring new posts in Sandburg's Hometown! This should be #271! In his second, unfinished autobiography, Ever the Winds of Chance, Carl Sandburg wrote about listening to Faith Nash sing “The Song of the Shirt” in the Chapel of Lombard University. She was the daughter of Charles E. Nash, the president of the institution in the late 1890s. Miss Nash had a lovely contralto voice which suited the words of the song. The words were first written as a poem by Thomas Hood and published anonymously in 1843 in London. The poem was about a Mrs. Biddell (whose first name has been lost to history). She stitched shirts for men in her home. In those days collars were made separately and could be detached from shirts and changed more often. The cloth was provided by her employer who demanded a two pound deposit for the fabric and findings. Mrs. Biddell had no money for food for her sick child so she pawned the completed shirts. She was forced into the poor house where she had to work seven days a week. The conditions were inhumane and there was no relief to be had. The poem quickly became a rallying cry for the working class, brought attention to appalling working conditions in England, added to the popular call for the formation of trade unions and helped create support for more strict labor laws. 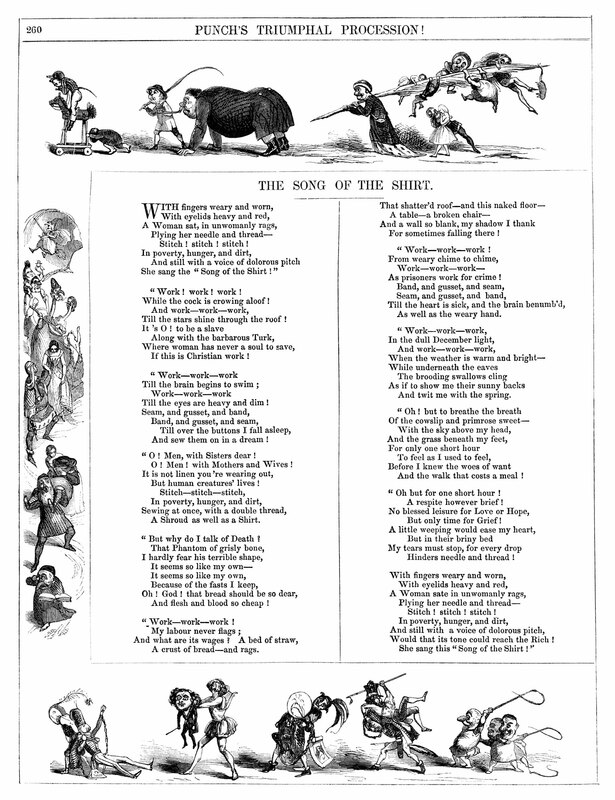 Thomas Hood was the author of “The Song of the Short.” He was born May 23, 1799, in London. His first job was as a counting house clerk. Next, he worked as an engraver. His health began to fail and he was sent to Dundee, Scotland, to stay with an aunt. While there he enjoyed outdoor activities and began to write humorous articles for local publications. It is interesting to note that he hand printed the final copies of his poems. He felt transposing the words from cursive writing helped in editing the lines. Hood returned to London in 1821 and became a sub-editor of The London Magazine. Through his work he became acquainted with other writers and developed his own abilities. Over the next few years he founded several magazines and published books of poetry. He often wrote of current events but with sympathy for individuals. Charles Dickens wrote on similar topics and praised Hood’s work. Hood was bedridden the last several years of his life, but continued publishing his writing. He died May 3, 1845. He was buried in Kensal Green Cemetery. His wife, who had helped with his writing and publishing work, died less than two years later. A son and a daughter survived. In 1854 a monument was placed on Thomas Hood’s grave. It was paid for by public subscription. Perhaps the contributions were made in appreciation for “The Song of the Shirt”. The poem was later set to music and in the late nineteenth century became a popular vocal addition to music programs everywhere in this country.